LoveToKnow Seniors recently had the pleasure of interviewing Sue Johnson, co-author of the popular grandparenting book, GrandLoving. The GrandLoving author trio is made up of Sue Johnson, her daughter-in-law Julie Carson, and Johnson's daughter, Elizabeth Bower. 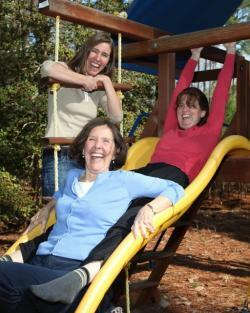 All three are former teachers and mothers, and Johnson is the proud grandmother of six. Already in its fifth edition and winner of eight awards, this book offers practical advice and thoughtful information for grandparents of all ages. Whether you take care of your grandchildren full-time or if you live thousands of miles away from them, GrandLoving is full of ways to connect with your grandchildren and build a bond that is as lasting as it is fulfilling. LoveToKnow (LTK): This is your fifth edition of GrandLoving. What goals/visions have remained the same across all editions of the book, and which goals or visions have fallen by the wayside or are brand new? Sue Johnson (SJ): Our consistent goal has been to help families connect the generations and to provide ideas and encouragement to grandparents. None of our visions have fallen by the wayside, but we continue to try to improve communications between family members. Throughout GrandLoving, we're careful not to talk down to grandparents, but rather we give them encouragement, tools and ideas to light up the eyes of those special little people in their lives...their grandchildren! Many of us are working hard to make our relationships with our littlest family members richer, more meaningful, and more fun. Our hope from the outset has been to give readers the best activities and ideas--the keepers--that came to us from 375 generous grandparents, parents, and grandchildren from around the world. LTK: It is striking that, nowadays, so many grandparents and grandchildren live so far away from each other. What advice do you offer these grandparents on playing an active role in their grandchildren's lives? SJ: Don't worry about the distance, but use whatever means works for your family to stay in touch. We believe open, consistent communication brings the generations together. Wise grandparents realize that the frequency of communication is more important than what they send or what they talk or write about. One of our parent contributors told us that her mother sent things so frequently that little Billy thought even the pizza man at the door came from Nana! Snail mail, phone calls, texting, email, skyping, CD's and of course visits are all ways to connect despite the distance. When you are together, take lots of photos and pay attention to details about your grandchild's life. Having photos to send back and forth and knowing aspects of your grandchild's daily life will mean a lot as you stay connected across the miles. Chapter 7, More Mailbox Treasures, is a book in itself, as it's where we provide all the creative, mail-able projects you could possibly want to keep a long-distance relationship thriving. Send a love note in or on a deflated balloon, send a family photo cut into puzzle pieces sent with the note, "Put this together and see who loves and misses you!" or pop a secret coded message in the mail. 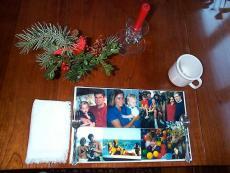 A collage of family photos laminated into a placemat allows you to smile up at your grandchild at every meal! Spend time instead of money, and communicate frequently. 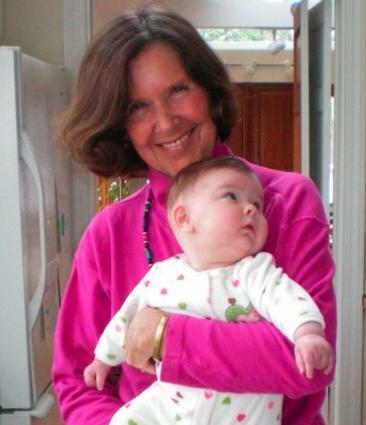 LTK: As a mother and a grandmother, what is similar/different about these two pivotal roles? SJ: As a mother you and your husband have the ultimate responsibility for raising your child. As a grandparent, your role is less demanding. It becomes more of a supportive role, and it's wonderful to have experience as a guide. As grandparents we realize how quickly children go through stages, and we know too how fast they grow up. As a grandparent, it is a true gift to see the world again through the eyes of a child--to have time to appreciate and share in their enthusiasm, wonder, and awe at the smallest thing such as how the cream swirls around in your coffee cup! It's rejuvenating to allow yourself to be a kid again when you are with your grandchild. It'll keep you vital and young at heart if you can jump right in and be a playmate to your grandchild. It's important to remember that we had our chance to parent, and now it is this generation's turn. Our position should be to support our children in their parenting role and realize that we are not in charge. Balancing the needs and wants of a growing multigenerational family without being in charge is a challenge. Though other cultures and past generations may have considered their elders as the experts in child rearing, that is no longer the case, as today's young parents have a wealth of professional advice from which to draw. LTK: The role of being a grandparent is important. What roles do grandparents play in a family? SJ: Teacher, mentor, caregiver, playmate, source of family history and values...the list can go on and on. The key is to be true to yourself and be who you are, and your grandchildren will love you for that. When we were teachers, we learned that there is no one right or wrong way to parent, but that many styles make for happy, healthy children. The same holds for grandparenting. We know that grandparenting is not a skill to be taught, it's an art to be nurtured by sharing other grandparents' experiences and insights. Becoming a grandparent has been both an exhilarating and an unsettling experience. I've felt mixed emotions. Having lost our first four pregnancies, my husband, Rick, and I realize more than many the miracle and gift a new baby truly is, so I've felt a genuine elation. Yet I've also felt an awesome responsibility and desire to protect our grandchildren and model for them the very best of values and goals. By sharing our successes with our grandchildren, we can give them someone to look up to, and by sharing our struggles, we can teach them the value of perseverance during hard times. Rick and I have felt an incredible melding of the past and the future all rolled into these precious little ones--in them are all our genes from past generations as well as all our hopes for the future. LTK: How does a grandparent's role change as the grandchild goes from baby to child to teen, and finally becomes an adult? SJ: Basically, the grandparent will grow with the grandchild if they are tuned into that child. As the child's interests change, so will the opportunities to connect on different levels with the grandchild. We've always felt that if a strong bond is developed when the child is young, that when the stormy teen years arrive, it might just be the grandparents to whom the teen turns when things at home become a little rocky. As the grandchild becomes an adult and grandparents become elderly, sometimes roles reverse, but it's still important to set a good example and pass along family values. LTK: Your book is full of tips and information. If you could give only one piece of advice to grandparents, what would it be? SJ: It's important to provide unconditional love, acceptance, and encouragement. Grandparents should give grandchildren their time and a feeling of belonging to something greater than themselves. They are in a unique position to pass along the family history and provide the stability of roots so important in today's fast paced world. 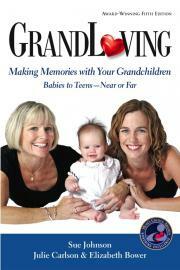 LTK: Do you envision a sixth edition of GrandLoving? SJ: I have a file for the 6th Edition! But at the moment we're concentrating on sharing our new 5th edition with families. Already the winner of eight national parenting awards, it has many additions and improvements. It has been a joy to add our daughter, Beth Bower, to the co-author team. Her fresh ideas and help with the new chapter on using social networking and the latest technology to connect families has been invaluable, and she did a superb job updating all the recommended books and resources. GrandLoving is truly becoming a classic, and we always invite readers to send us their stories and favorite new activities for our web site and future editions. Because of frequent requests, we'll probably continue to expand our chapter on "Tweens, Teens and Beyond". Of course a new edition will include updated resources as well as new book recommendations, and as technology changes so fast, that too will undoubtedly need to be updated. For more information on the book or to purchase a copy, visit the GrandLoving website. An excellent gift for grandparents, the book can also be purchased at Amazon.com and other major book retailers.